Streamline order management by integrating your Miva Merchant online store, QuickBooks and Shipping Services. T-HUB order manager for Miva Merchant provides a simple interface to download Miva Merchant orders into QuickBooks. T-HUB allows easy shipping of Orders from Miva Merchant with shipping services from FedEx, UPS or USPS (shipping with USPS requires an account with Endicia or Stamps.com). Available in windows desktop version and an Online Cloud version. T-HUB is the desktop version that runs on your windows computer. T-HUB is available in Standard, Pro and Advanced editions. 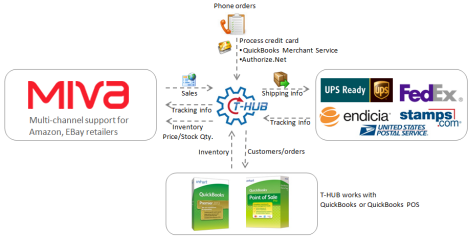 T-HUB works with QuickBooks desktop, QuickBooks Online and QuickBooks POS. Supports shipping with UPS, FedEx and USPS. T-HUB Online is a cloud based SaaS offering application. T-HUB Online works with QuickBooks desktop. Ship packages with UPS, FedEx (coming soon) and USPS.